I will start with the ever-so-common ingrown toenail. 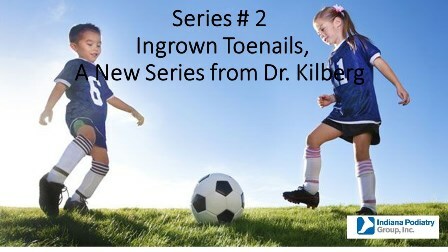 Ingrown toenails in kids generally occur due to genetic factors that cause the nail to become ingrown from the start during development in the womb, as opposed to many adults who develop ingrown toenails later in life from pressure and damage to the nail that causes the root cells growing nail to deform and grow the nail inward. The ingrown shape of the nail itself is not usually a problem, unless skin next to it becomes inflamed. Once inflamed, the skin is sensitive, and the nail growing into it can cause pain at that point. Bacteria can also become trapped, leading to infection and drainage. Children can irritate the skin next to the nail quite easily through rough play, clumsy object handling, as well as poorly fitting shoes during growth periods. Symptoms typically include pain with pressure against the side (or both sides) of the toenail, as well swelling and redness to the skin next toe the nail. Drainage can develop (though not always), as well as sometimes a very puffy section of red-pink tender skin called a granuloma. Because of the shape of the nail, persistent issues of the ingrown nail is to be expected over the years, and it is often not enough to simply treat at home. Many people try home remedies at first, including cutting the nail back, soaking the toe, and perhaps having the pediatrician or family doctor prescribe antibiotics. However, permanent removal of the side of the nail by chemically destroying the nail root cells is the best way to get permanent relief. The results are excellent, the procedure is quick and easy to perform in the office, and it is rare for complications to develop. Most kids easily tolerate the only ‘bad’ part of the procedure, which is the numbing injection.